Early this morning we left the Hinlopen Strait and entered the Freemansundet. We were heading for Thymensbukta, which is located at the north coast of Edgeøya. 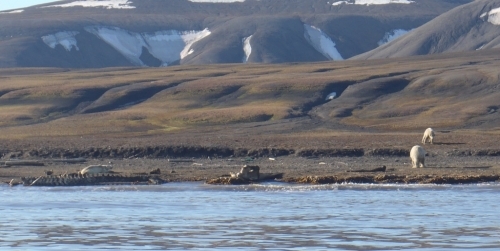 Edgeøya is the third largest island of the Svalbard archipelago. Storfjorden separates Edgeøya from the island of Spitzbergen. Our Expedition Leader Bud had gotten word from other expedition ships that a whale-carcass was stranded on the beach of Thymensbukta – and that a lot of Polar Bears were around to feed on it. Sharon, our lovely Receptionist, took me along on a Zodiac tour. We got a pretty good look at the carcass – and some Polar Bears. Later on I heard that 13 bears were seen on the beach in in its vicinity while we were visiting.